Arenal tours will have you entertained for days: hot springs – natural spas of thermal waters, waterfalls, rainforests, canopy tours, rafting, volcano views, and more! 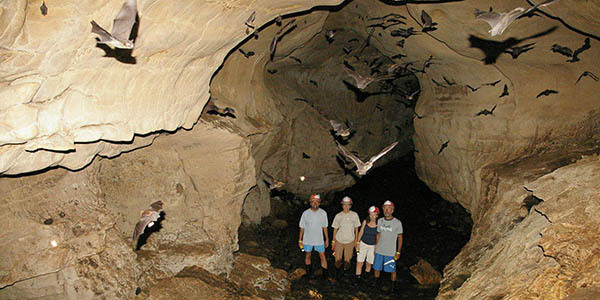 Journey into the depths of the earth on this two-hour Venado Caves spelunking tour near Costa Rica's Arenal Volcano. Visit Arenal's nature reserve, Eco Centro Danaus, to learn about their sustainability efforts and see some amazing tropical wildlife. Experience a river rafting adventure in Arenal, Costa Rica. A series of fast rapids with curves will get your adrenaline pumping! There’s something special about Arenal, the “adventure capital of Costa Rica.” Or, more accurately, many somethings special: It’s the iconic volcano, with its near-perfect cone. It’s the town’s bubbling hot springs – natural spas of thermal waters and medicinal mud. It’s the waterfalls, the caves, the forests and the rivers. It’s the canopy tours and waterfall rappelling and whitewater rafting and nature hiking. Arenal’s appeal is undeniable. Arenal tours blend nature with adventure, sports with leisure. Teeter along hanging bridges suspended high in the forest canopy; rappel into lost waterfall canyons; ascend the slopes of ancient volcanoes; rip-roar through the countryside on an ATV; and hike down to a frothing waterfall, where a mountain river tumbles into a baby-blue swimming hole. Soar into the skies on an exhilarating canopy tour or on a lowkey aerial tram; pour your heart into mountain biking; sip local java on a coffee tour; and test your mettle on a white-water rafting expedition. Even better, many of these awesome adventures culminate in a finishing touch only Arenal can provide: a visit to the local hot springs. Luxuriate in bubbling mineral waters and let the heat knead out the kinks and melt away your stress. There are several springs to choose from, including secluded pools and family-friendly springs with swim-up bars and waterslides. 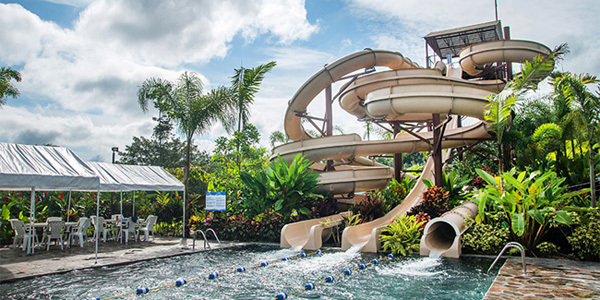 And if you loathe to give up the fun, Arenal swoops in with adventure connections – thrilling activities that transport you from Arenal to other destinations. Mount a horse, then a boat and then another horse, and head to Monteverde. Tackle class II-III or III-IV whitewater rapids on your way to Guanacaste or San Jose. Or stop at Poás Volcano and the famed La Paz Waterfall Gardens on your way back to the airport. Arenal doesn’t want the adventure to end. Download PDF with a full list of available tours in Arenal volcano area.